1. Curiosity! You are done watching everyone else have the fun and are ready to experience it for yourself! 2. You are hesitant to invest your time and money into the full certification. Relax! Try it first and decide later . . . although we're pretty sure you'll be back for more! 3. You need a creative date night or want to experience something new. It's an affordable way to create lasting memories. 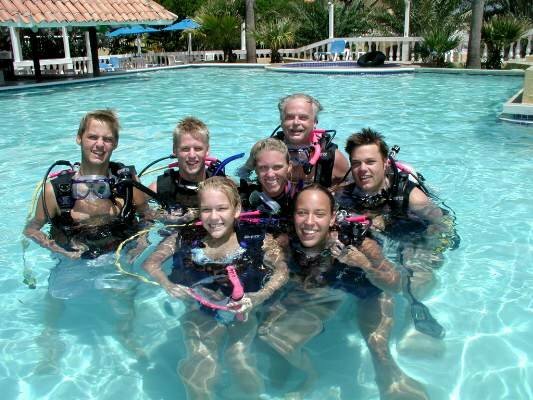 The Discover Scuba program is designed to give you a chance to experience the thrill of scuba diving. Your Instructor will guide you through the basics on diving in general and the equipment that you will be using. That is all it takes to have your first experience of breathing underwater in the safe and warm confines of a heated indoor pool! If you would like to find out how easy it really is to become a certified scuba diver, just ask anyone who is certified! at the beginning, and a lot of fun during the course! Everything is provided, including scuba equipment, mask, fins, and snorkel. All you need to bring is a swimming suit, towel and your eagerness to Discover Scuba Diving! Class size is limited so please stop in or call us ahead of time to register for your introduction to the underwater world! Please review the Medical Release prior to your course. If you answer YES to any question, you will need to see a physician PRIOR to participating in a scuba course. You can download the form below. Hey Moms and Dads…..Ask us about our Discover Scuba Birthday parties! It’s a unique idea that won’t be soon forgotten for 8yr. olds & up! Discover Scuba is great for corporate team building parties! Requirements: Please bring a bathing suit, towel and all required paperwork.